“Authentic European Pleasure” was the working title of my press trip. The destination was the gourmet hideaway Bologna and the surrounding area. It is the production site of many meat products and covers the territories of Emilia Romagna, Piedmont, Lombardy and Veneto. A culinary blend of flesh, local pleasure and internationality. The charme of this region is legendary. A magical region that entrals its visitors. Fine dining, local kitchen, prosciutto and mortadella were our constant travel companion. Beautiful wines were also included. The hours can be wilded away at this region. For us tt was about the secrets of Italian cooking, sausage production and the disclosure of how important not only the raw material, but also the production of high-quality products and the production environment is. The name Mortadella dates back to Roman times. The name comes from the word “Mortarium”, a tool used to crush pork. From the late Renaissance, numerous traces of this product can be found in literary and historical evidence. Mortadella has been expanding its presence on the Italian and foreign markets since the 19th century, thanks also to the first industrial production methods of pork processing. The Mortadella is a source of authoring cinema inspiration: Mario Monicelli paid homage to Mortadella in a film starring Sophia Loren and Bigas Luna in “Bambola” (1996). For me as a cineast, a joyful thing. The ideal serving suggestion is together with white bread. But Mortadella is often used as a filling for Tortellini Bolognese. Yummy. Furthermore the press trip took us through Italy, both in private houses with traditional “Cotechino di Modena” cooking and in exclusive restaurants like the Tavera del Castello in Parma (already waiting for their Michelin star). Meat was served in all variations, Mortadella foam, Mostarda, tortellini, beef and much delicious Parma ham the ingridients were always Italian, just like the fine cuisine everywhere. The trip was supported by the European Authentic Pleasure campaign, co-funded by the EU and organized by the Italian sausage consortiums Istituto Valorizzazione Salumi Italiani, Consorzio Cacciatore Italiano, Consorzio Mortadella Bologna and Consorzio Zampone e Cotechino Modena IGP. 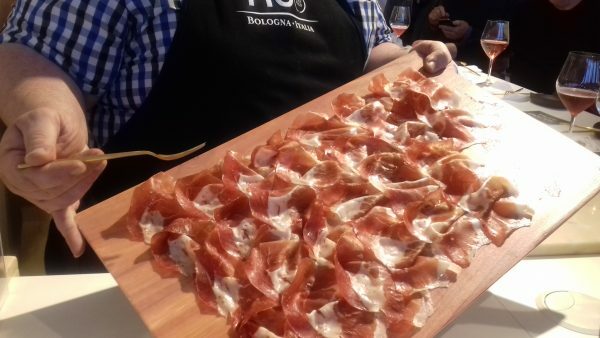 The project aims to promote and increase the awareness and popularity of Italian cured meats certified by the Italian DOP (Protected Designation of Origin) and IGP (Protected Geographical Indication) labels on the German market.